I was able to obtain this rare spoon from a Dutch contractor who found it buried in the walls of a 15th century house which he was modernizing. The size, shape and material indicates that it was probably created in the 1450-1550 time frame. I am unsure of the exact type of metal used in this spoon. 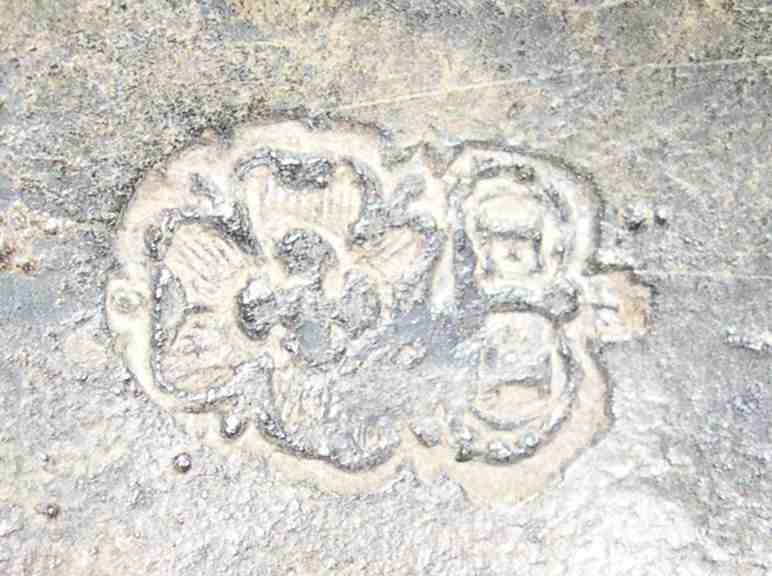 It is probably a 'pot' metal and probably a derivative of bronze or pewter. As you can see from the corrosion, it is in delicate condition, but it is still intact. Most of the spoons surviving from this era are also pretty corroded. Unfortunately I do not know much else about this piece. The horseshoe and leg at the finial is supposedly for good luck. But I have also seen it referred to as "deer foot". Other spoons of this era may have different designs at the knop. There are very few surviving spoons from this era in any metal and many of the survivors are broken or incomplete..
September 1, 1978 | By ALBERT SCHER; from The Magazine ANTIQUES, September 1978. When Helen Burr Smith wrote about silver spoons with hoof-shape terminals in ANTIQUES in 1944 there were only four of these interesting survivals from seventeenth-century Dutch New York households known in America. Now two more hoof spoons have come to light. Fig. 1-Silver hoof spoon, probably New York, seventeenth century. Length 6 9/16 inches. Inscribed F-A on the flat of the hoof. It is nearly identical to the spoon shown in Figs. 2, 2a. Private collection; photograph by Meyers Studio. One bears the initials of the unidentified first owner F-A, in seventeenth-century lettering on the flat of the hoof, but is otherwise unmarked (Figs. 1, 1a). It appears to be identical to a spoon made by Ahasuerus Hendricks (Figs. 2, 2a) that was discussed and illustrated in Miss Smith's article, except that the bowl of the spoon in Figure 1 is slightly larger than that of the Hendricks example. In both cases, the hand-wrought fig-shape bowl is nearly soldered to a rattail extension of the handle-a construction feature typical of seventeenth-century NewYork spoons. The fig shape of the bowl attests to the early date of the spoon. John Marshall Phillips wrote, "...the earliest form [of spoon made in America] has a deep fig-shaped bowl... this style, popular in England during the Commonwealth, dates back to the fifteenth centry." And Miss Smith pointed out, "Because of its fig-shaped bowl, the Hendricks spoon is thought by experts to be probably earlier that the other hoof-handled spoons" known in 1944, and possibly even earlier than the oldest known American spoon which was made about 1664 by John Hull (1624-1683) and Robert Sanderson (1608-1693) of Boston. Close examination of the spoon shown in Figure 1 reveals that the angle formed where the cast handle joins the bowl is greater than that on the Hendricks spoon. This has suggested to some experts that this spoon is even older than the Hendricks example. Fig. 2-Silver hoof spoon made by Ahasuerus Hendricks, New York c. 1680-1700. Length 6 ½ inches. Marked AH conjoined on back of the bowl (Fig. 2a); inscribed on the flat of the hoof I-L for the first owner, possibly Johannes Lansing. Yale University Art Gallery, Mabel Brady Garvan Collection. The second newly discovered hoof spoon (Figs. 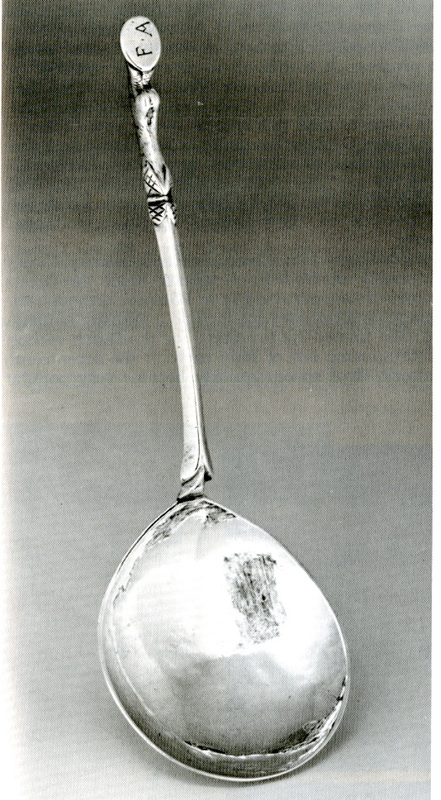 3, 3a) is one of the few pieces of silver-and the oldest spoon-known to have been made by Bartholomew Le Roux, the first of a distinguished family of early American silversmiths. His family was of French descent and had lived for some time in Holland before moving to England, where Le Roux was trained. A skilled craftsman by the time he arrived in New York, where he was married in 1688, his known silver shows that he could work in both the Dutch and English traditions. For instance, a two-handled bowl with paneled sides (in the Mabel Brady Garvan Collection at Yale University) is designed in the true Dutch style, while a richly decorated caster marked by Le Roux, also in the Garvan Collection, is very similar in design to an English example in the Victoria and Albert Museum. Le Roux's hoof spoon is an interesting blend of the two styles. Typical of hoof spoons made in England, but not of those made in Holland, the flat of the hoof faces the back of the spoon. On the other hand, the series of graceful molded lobes at the base of the cast handle is a feature of seventeenth-century Dutch spoons. The recently discovered hoof spoons are both in excellent condition, which suggests that they were presentation pieces-rarely-if ever-used for eating. It is known that the silver spoons were given as gifts to mark special occasions in the Old World, and many of these traditions were brought to America in the seventeenth century. For example, Dutch godparents gave a gebortelepel, or birth spoon, to a newborn child; newlyweds were often given a silver spoon; and an engraved silver spoon was commonly presented to each pallbearer at a funeral. However, the penchant of seventeenth-century Dutch painters for realistic still lifes gives us proof that hoof spoons, at least, were pressed into everyday use on occasion. Still Life with Glass and Metalware, by Jan Jansz. Den Uyl (c. 1595-c. 1640) and a still life of about 1637 by Willem Claesz Heda (1594-c.1682) both include hoof spoons in scenes of a meal in progress. It is difficult to determine whether the spoons in the paintings are silver or pewter, but their presence in works by these seventeenth-centry artists helps to date this type of spoon. Joyce Fleur of the Haags Gemeentemuseum in The Hague feels that silver spoons, possibly hoof spoons, may have been used to eat the brandy soaked raisins that rich Dutchmen served on feast days in silver bowls similar to the one by Bartholomew Le Roux mentioned above. According to John Emery, hoof spoons are probably ultimately derived from spoons made in Greco-Roman times, particularly in Pompeii, although the Pompeian form does not include a realistic animal's leg. The immediate prototype for the Dutch spoons, he says came out of Italy early in the seventeenth century. Hoof spoons quickly became very popular in Holland and remained in vogue until about 1660, when they were replaced by spoons with grotesque figures for terminals. During the seventeenth century the Netherlands enjoyed a period of unequaled wealth. It is not surprising; therefore, that Dutchmen who came to America brought not only such symbols of their prosperity as silver spoons, but also their Old World traditions and attitudes. Silver hoof spoons are rare, fascinating reminders of this early Dutch influence in America.